Welcome to NetSuite, the world’s #1 Cloud business management solution. As Customer Support Representative, you are the vital link to customer needs, concerns, and satisfaction. You need up-to-date information to help resolve issues quickly. It is critical for you to have an integrated solution, one that is easy to navigate and that gives you 360-degree visibility and access to accurate, real-time customer data 24/7. NetSuite delivers integrated solutions helping you speed case resolution, ensure customer satisfaction, and lower service costs. Let’s look at an example. Deb, the customer service representative of a global wholesale distribution company, has customized her NetSuite dashboard to keep track of metrics and tasks pertinent to her role. When a customer calls in with an issue, the call is routed to the appropriate support representative based on skill set. 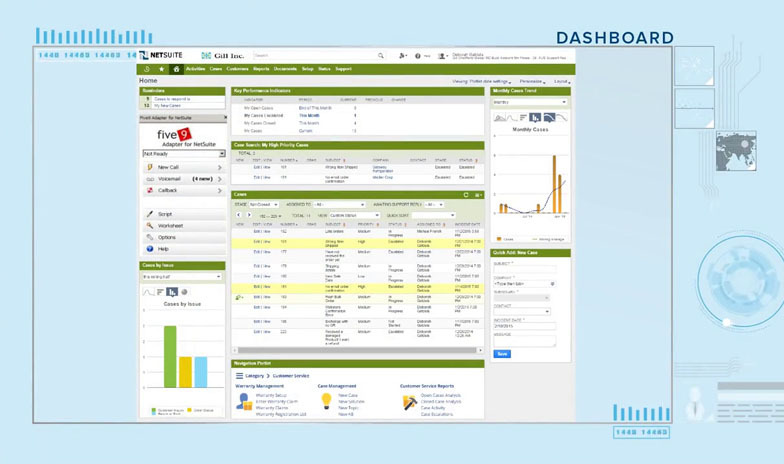 Deb sees the customer screen pop up in NetSuite with Telephany Integration. The customer wants to return incorrect items that were shipped and get the correct items. Deb promises quick action. She immediately pulls up the customer record, logs in a case, and escalates it to the sales and warehouse teams ensuring correct items will be shipped. Since Sales, Support, Shipping, and Finance are on the same system, they have access to the same customer record in real-time, wasting no time and effort. The customer receives automatic receipt confirmation with a case number. With the updated case status at her fingertips, Deb calls the customer and informs him that correct items are being shipped. Deb also guides the customer to the NetSuite Knowledge Base and Customer Center that provides customers quick, personalized, interactive answers and support. The customer can also update their profile, view order histories, check order status, and place new orders around the clock. Both the Warehouse Manager and the Accounting department are alerted when the incorrect items are received to close the loop. NetSuite reduces service costs, improves customer satisfaction and retention enabling you to provide superior customer service across every touch point.